This book presents both fundamental knowledge and latest achievements of this rapidly growing field in the last decade. It presents a complete and concise picture of the the state-of-the-art in the field, encompassing the most active international research groups in the world. 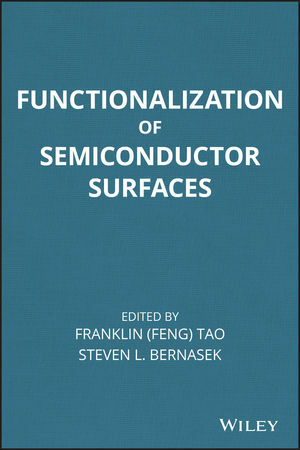 Led by contributions from leading global research groups, the book discusses the functionalization of semiconductor surface. Dry organic reactions in vacuum and wet organic chemistry in solution are two major categories of strategies for functionalization that will be described. The growth of multilayer-molecular architectures on the formed organic monolayers will be documented. The immobilization of biomolecules such as DNA on organic layers chemically attached to semiconductor surfaces will be introduced. The patterning of complex structures of organic layers and metallic nanoclusters toward sensing techniques will be presented as well. FRANKLIN (FENG) TAO, PhD, is Assistant Professor of Chemistry at the University of Notre Dame. His research group is actively involved in investigations of surface science, heterogeneous catalysis for efficient energy conversion, nanomaterials, and in situ studies of catalysts. Dr. Tao is the author of about 70 research articles and the recipient of the International Union of Pure and Applied Chemistry Prize for Young Chemists. STEVEN L. BERNASEK, PhD, is Professor of Chemistry at Princeton University. His research focuses on chirality in self-assembled monolayers, surface functionalization and modification, organometallic surface chemistry, and dynamics of gas-surface interactions. Dr. Bernasek is the author of more than 200 research articles. He is also the recipient of several awards, including the ACS Arthur W. Adamson Award for Distinguished Service in the Advancement of Surface Chemistry.